Many types of preserved food were produced in ancient Sumer. These included dried figs and apples, which were thread on string like those shown hanging on the wall. Pulses such as beans, peas, and lentils were also dried, as were grapes to produce raisons. Nuts too, such as almonds and pistachio that were eaten in Sumer can be kept a long time in dry conditions as can garlic. Milk, because it did not keep well in the hot climate, was mainly used to make yoghurt, or a form of butter know as ghee and cheese. Fish were often dried, salted, or smoked and meat was pickled. Two other consumables that were similarly important in the Sumer were bread and beer, both normally made from barley. 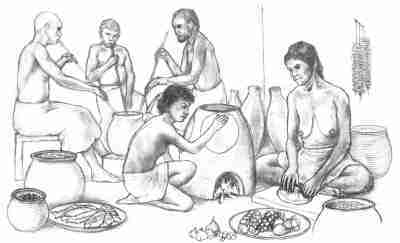 Bread is still cooked in the Middle East using tanur ovens like the one illustrated. Beer was often drunk through a reed from a communal pot, or using a silver straw if you were wealthy. Wine was also produced from grapes, in addition to the alcoholic beverages produced from figs and dates - and most types of alcoholic drink keep well. The preservation of food and drink were probably significant factors in ensuring the long-term viability of the earliest urban societies.